Tap, tap, tap. That’s the sound of your siding being destroyed. Woodpeckers and insects can create massive issues in a home with wood siding—ranging all the way from aesthetic flaws and defects to huge structural problems that threaten the safety of your home. However, you don’t have to passively accept whatever damage these invaders wreak on your home. There are many ways to defeat wood pests—and even some things you can do to prevent problems before they even begin. 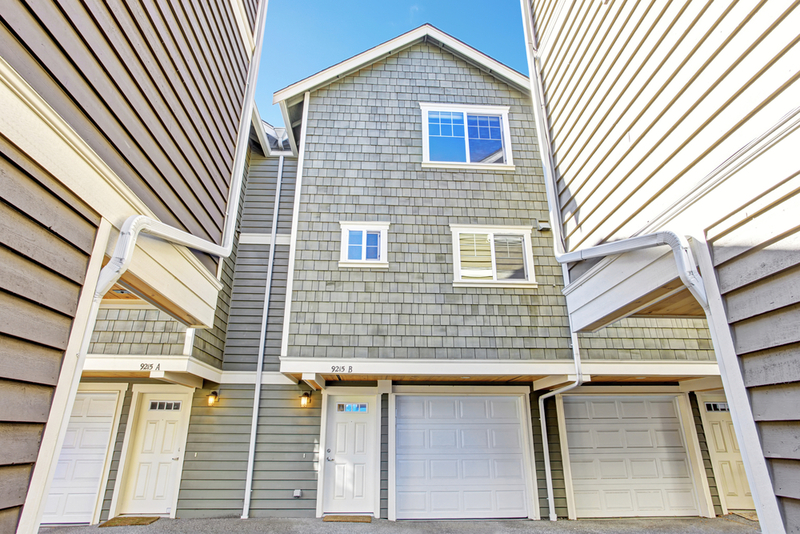 The most disastrous issues come from pests that burrow into wood siding, destroying the effectiveness and aesthetic appearance of your siding. Here’s how to spot the most common invaders, and what your next move should be when you see them. Termites. Subterranean termites live underground, feeding on wood surfaces buried below the surface. When they’ve expended those food sources, they often create “feeder tubes”—hollow channels in your siding that destroy the structural integrity of the wood. Because these tubes are hidden under the surface of the siding, they’ve often difficult to spot before it’s too late. However, a good way to test for infestations is to tap the siding with a screwdriver—a hollow sound indicates a possible problem. Termites cause such serious damage that you’ll generally need to engage a professional pest management service to get rid of them. The exterminator will typically bait the soil surrounding your home with organophosphate and pyrethroid insecticides. Carpenter ants. Carpenter ants often favor insulation and inner walls, but will make their way outward to siding as their colony expands. They typically prefer moist, rotting wood, so their presence can indicate a problem with decaying walls, too. Signs of an infestation include small piles of wood shavings produced as worker ants tunnel into the surface of the wood. You also might see the ants themselves—they’re small and black-colored, and produce winged swarms during the warmer weather. You can diagnose problems with carpenter ants yourself—insecticide baits for the nests can be bought at a home goods store. It will also pay to do some inspections of your attic vents and foundation—as well as around openings in your outer envelope and roof for pipes, chimney, and vents, since these sites are common spots for nests. However, if the problem is expansive, it never hurts to hire a professional who can seek out nests for you. Powder post beetles. Powder post beetles live inside wood, feeding on the starches in the wood fibers until they reach maturity. At that point, they tunnel back outside to the exterior of the wood, leaving fine sawdust and tiny sets of holes in their wake. The most noticeable evidence of a beetle problem is the appearance of small exit holes—they perforate wood surfaces with tiny openings, making it look like a sponge. If it’s dusted with a fine powder that resembles flour, that’s a dead giveaway that you have a beetle problem. The best way to handle beetle infestations is to cut off their moisture, which you can do by following the tips listed in the next sections. Spraying a wood preservative treatment onto the surface will also help, although not if the wood on your home is stained. You can also have a pest exterminator fumigate your home or apply a pesticide into the interior of your siding using a wood injector. Carpenter bees. These small nuisance pests resemble bumblebees, but they’re far more damaging to your home. They tunnel into wood to create nests, which they reuse season after season. The good news is that carpenter bees are pretty easy to defeat. To destroy the nests, fill the holes with insecticide, and then plug them with appropriate exterior caulking. Woodpeckers. Woodpeckers usually announce their presence with their notorious tapping, and they’re pretty easy to catch in the act. 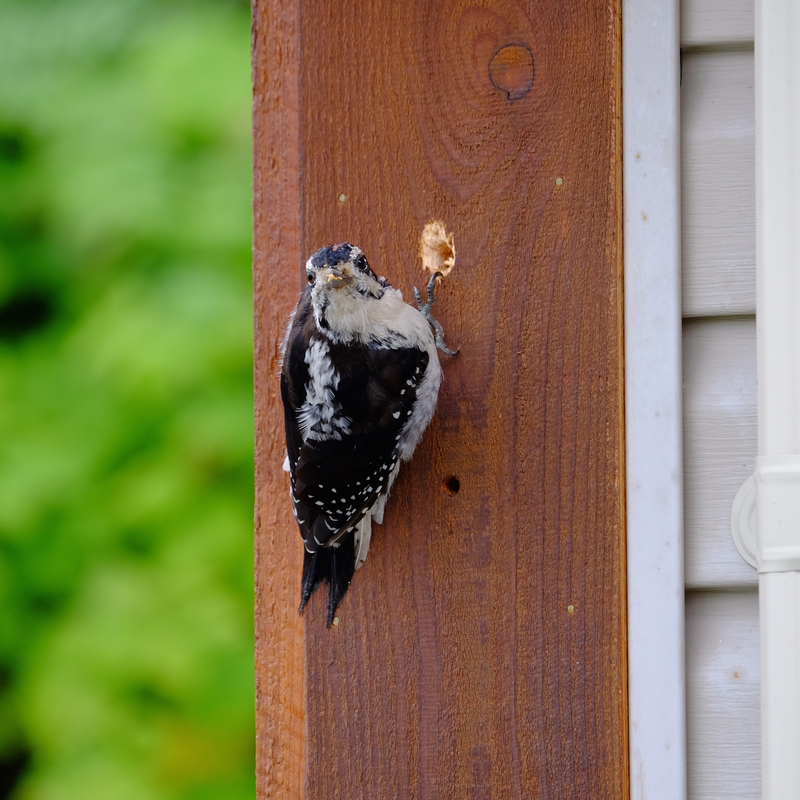 Woodpeckers usually attempt to drill into corners where two pieces of siding join—you’ll see the damage as smallish holes running along the edges. They particularly love homes covered in cedar shakes. To get rid of them the humane way, you can attach shiny materials or electronic deterrents to the side of your home—that makes your siding less appealing to woodpecker colonies. Or you can set up a woodpecker feeder or birdhouse, which will give them an alternative place to nest. Yes, your home’s exterior is built to withstand rainstorms and other weather. But standing water and constant moisture can cause real problems. Moisture causes wood rot, and pests just love to burrow into decaying wood surfaces—and of course, the wood rot itself poses a major concern for the structural integrity of your walls and siding. One of the best ways to avoid problems with dampness in your siding is to keep your home’s drainage system intact and functioning. That means cleaning your gutters frequently—at least twice a year—so that they don’t become backed up and allow water to spill over onto your siding. Inspect your downspouts regularly, as well, since damaged pieces can direct runoff onto your walls and into the ground surrounding your home. Downspouts should have an elbow piece attached to the end that pushes rainwater away from your home. There’s a reason homes have foundations. Beyond just supporting the walls, good foundation works to insulate your home and keep it dry and pest-free, too. Your foundation protects your siding from excess moisture in the ground so it can keep doing its job, but over time, erosion and the effects of weather can cause soil to build up against your walls. Pests mostly come from below, so if your wood siding is flush against the ground, there’s a greater chance for damage from moisture and the resulting insect infestations. If soil, overgrowth, or mulch have completely covered your foundation, you’ll need to dig yourself out to avoid future problems. Similarly, firewood stacked against the side of a home creates an opportunity for pests, as well. Wood-boring insects love to make homes in stacks of unseasoned wood, and since it’s in contact with the ground and your siding, it makes a perfect bridge for pests to get into your siding. Move firewood a few feet away from your home, and you can avoid the bulk of problems here. Insects can’t destroy your wood siding if you don’t have any in the first place. Vinyl, fiber cement, and aluminum siding all offer greater durability than wood—and fewer problems with rot and moisture, as well. Textured vinyl panels have come a long way in recent years and now closely resemble the pattern and grain of real wood. However, if you really crave the appearance of authentic lumber, fiber cement offers a nice alternative—it’s made up of natural wood fibers molded into cement, which helps it achieve the natural texture of wood. Take care to shore up any problems with runoff, though: insects can still threaten the wood behind the siding if the conditions are right. Proper maintenance is always your best defense against pests!